Painting portrait of a woman. Here is a portrait paint I did a few day ago. It takes me about a few hours. It was part of premium portrait video tutorial. Below are step by step images of how to paint this portrait. This is a digital painting using Photoshop and Wacom tablet. It’s very common among concept artists in video game productions and professional illustrators. As for video tutorial this one is part of a Premium How to paint portrait Face Constructed 2, the video tutorial has over three hours of lessons with 14 chapters. 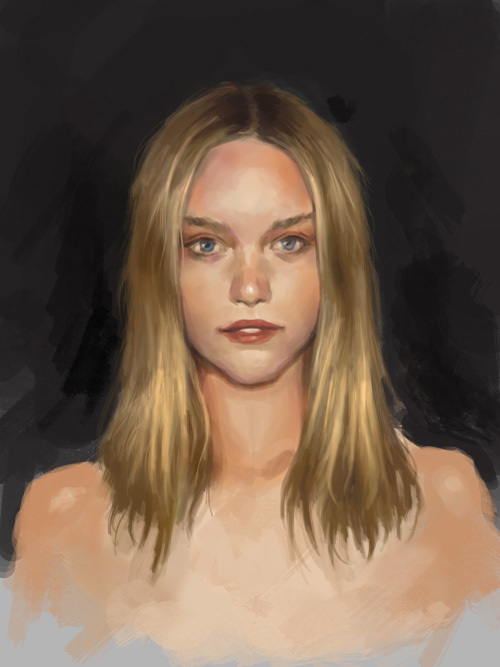 It has in depth demonstration how to paint portrait from front view, three quarter view, side view (profile) and painting with custom made Photoshop brushes. The final piece could still be taken further all the way to more finish and refinement. This tutorial is just to show you how to establish a concept or stylize face to where I consider it finished in my own term. I usually work in games so the turn around time is quick and I have to establish some idea in a quick way. So it is different from illustration and more of a conceptual and that’s just how I do it. 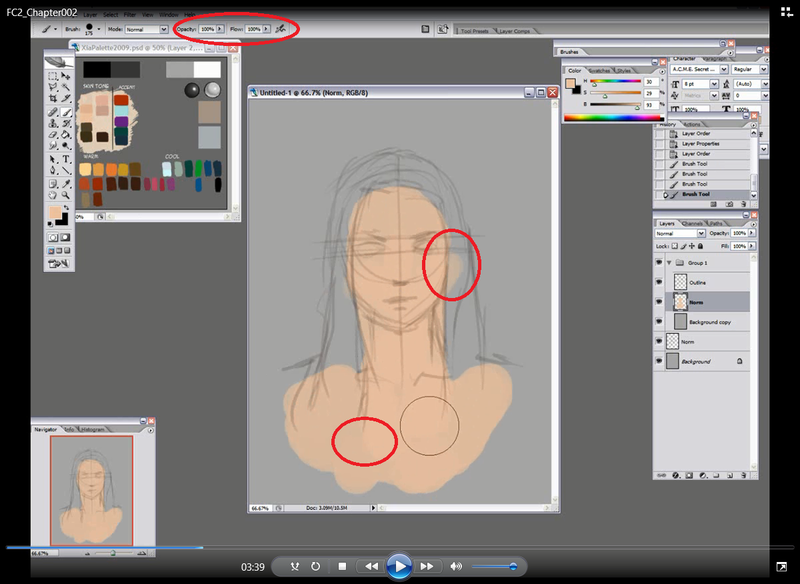 Below are step by step images show you how to paint portraits. Step 1, I pick a cool background then I do a quick mark up of a girl’s head then paint in a base skin tone (in the case, I thought it is a bit too yellow). I try to layout a basic facial structure. Whenever I am designing a face head, I always draw it all the way to its shoulder, but keep it loose. It makes more sense to me, rather than just a head alone. The whole package can convey more expression, I believe. Step 2, Once I have all the lines that I need to construct my face, I then start blocking in the basic feature with a combination of tighter lines and value. Step 3, Then I clean up the construction lines, leave only the one that I will need for paint over. In this case, I also change her skin tone a bit as I clean up. It was too yellow earlier so I tone it down a bit. Step 4, Once I have a solid drawing of where everything should be, I can then blocking in shape using value. I always look for where the shadow will be in facial first. I paint light at this stage, but I do go really dark on hard edge like under the nose, eyes, and upper lips (They are the usual suspects). On this one I am not really looking to use dramatic shadow or high contrast technique. I am going to keep it simple and clean. Step 5, Now I am applying a bit of red around her cheeks and tip of her nose. Then I defy her cheek bone a bit more, giving her a rough look. I darken certain part of her feature like under her chin, neck, and right part of collarbone to establish light direction a bit more. Step 6, Now since her face structure is already established, I am playing around with additional color. I give her blue eyes because it’s easy to see her pupils. Step 7, I am using soft brush to give her some settle shadow on the lower part of her face, her neck, and the side of her cheek. It’s really settle, you can hardly see the different, but when I apply lighter value around it, this settle value will come in handy to support the light. Step 8, Now I am painting in lighter value on her nose bridge, above her upper lip, cheek, top of her eyebrow, corner of her eyes and her chin. Step 9, The I add a bit more of highlight on her nose and her lower lips. Almost there, just keep tweaking here and there to make everything convincing. Then I finalize the facial concept with the hair and a block of paint for her top. It is not a big deal. Just press lighter. Just get the core value and the ideal down. You will be ok. You can’t get exactly what I get in one try or you will be a prodigy. I did watch FC1, it’s been helpful. I will go over it in detail more see if I can spot anything new. Btw I do have pressure sensitivity on. I’m using wacom intuos 5. But I still don’t get that transparency even in the control panel there is pressure sensitivity. Where do I find the setting? Yes, with pressure sensitivity on, it could happen. Not a big surprise. Unless you take that off. Though the thickness of the paint will still be stronger than the lower opacity. First, did you have the Face Construction 1? It is a prerequisite to FC2 as said in the description. Second, check if you brush have pressure sensitivity. Yes 100% can have slight opacity, but not much. Third, please watch it multiple times. I sometimes get e-mail like yours. (once in three or four months). The video goes very quick, you often will miss a few things. I believe I explain everything in the video better than I could ever explain in written words. Give it another shot. Hey Xia, I got your Face Constructed 2 video sets and they are pretty nice. But I do have a question while watching this video. When I follow you painting color, I can’t quite get the feeling of color where the they overlap and produce a different color just like they are having some sort of transparency. But the thing is you are setting the opacity at 100%, why do they still behave like transparent color? If I set my brush with something like 80-90% opacity I can get the same effect. But since I want to follow the exact procedure in the tutorial phase it’s good for me to figure out how it works and why it works. Here is a screenshot explaining my problem: you can see the brush opacity as 100% but the color you paint behaves like transparent. Can you explain it? Thanks.